We can handle most of your web design and development needs here at Paul Bunyan Net. We build customized websites that are tailored to our customer’s individual needs. You can check out some examples of our work below. If you would like us to build you a new website, redesign an old website or just help you out with making updates to an existing website, please contact us. 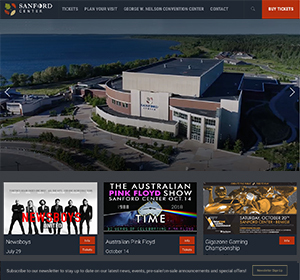 The Sanford Center website features upcoming events, venue information and details on the conference center. The site includes a Content Management System (CMS) so the client can edit the content as needed. The site is mobile responsive, allowing the layout to adjust to fit your screen size on phones, tablets and computers. Students First is a community effort to help students reach their full potential by pursuing their success plan goals with support from caring adults. The website includes a sign up form to become a success coach, FAQ’s, staff bios and contact information. A website devoted to showcasing what makes our region an outstanding place to live, invest and grow for the future. Take a look and discover your True North! This is an in-house project for Paul Bunyan Communications with 100% in-house artwork that is constantly adding new features. This site has a Content Management System (CMS) backend combined to work with a custom built team management CMS that features the ability to automatically setup practice times, message management and statistical reporting just to name a few of the many things it can do. Also built into this website is a custom programmed team signup form that integrates with Authorize.net to take online payments, a customized Open Source shopping cart, plus a customized online photo gallery. The site was rebuilt in 2015 as responsive site with Pinnacle Publishing doing the graphic design and taking over managing the content. 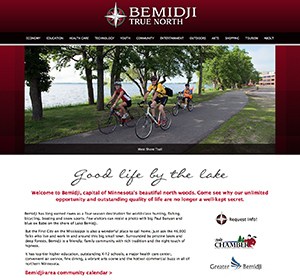 Greater Bemidji, Inc. is a non-profit, charitable organization serving the greater Bemidji region of north-central Minnesota. Its mission is simple: drive development and promote prosperity in the region. 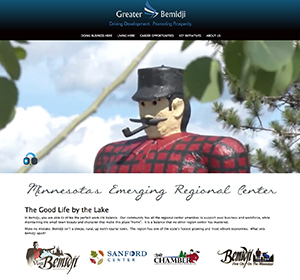 The website showcases why Bemidji is considered an emerging regional center and why you’ll want to work and live here. 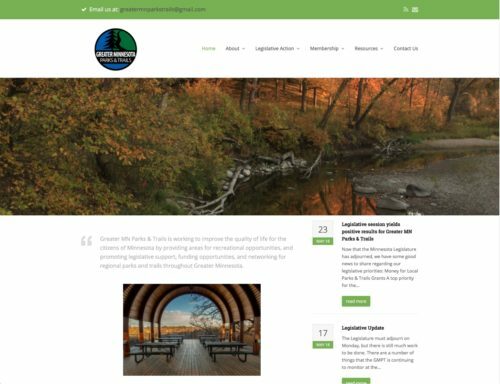 Greater MN Parks & Trails is working to improve the quality of life for the citizens of Minnesota by providing areas for recreational opportunities, and promoting legislative support, funding opportunities, and networking for regional parks and trails throughout Greater Minnesota. The website showcases upcoming events, legislative action, and resources. The broad charge of the SWCD is to protect public health, safety, and welfare through soil and water conservation. Functions include leadership, coordination and services. The website is a place for the SWCD to showcase current programs, products, events & minutes/reports. 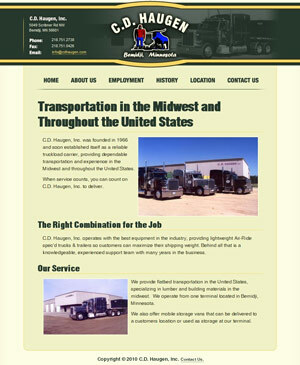 The site was built with a Content Management System for the client to have the ability to easily change content as needed. 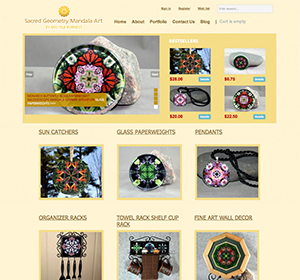 Melissa is a local artist who needed a website to sell her creations. We built an E-Commerce website for online sales and trained her on how to add and edit the products. Bi-County Community Action Programs, Inc. (BI-CAP) envisions a thriving, healthy, and inclusive Beltrami & Cass County. To reach that vision, they are committed to helping low-income people achieve self-sufficiency in the two counties. BI-CAP was established in 1966 as part of the national War on Poverty and is one of approximately 1,000 community action programs nationwide. 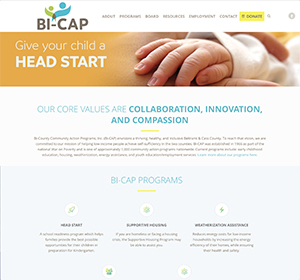 The website is a resource to learn about BI-CAP and the current programs offered. You can also make a donation to support programs in our community. 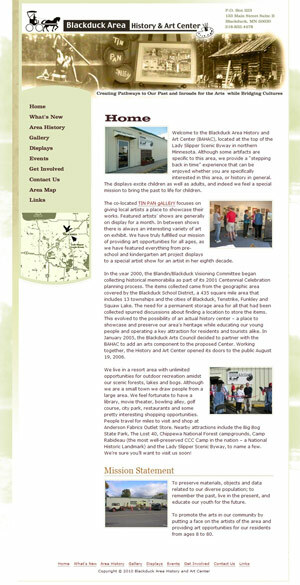 The Blackduck Area History and Art Center’s website features a custom built PHP and HTML template, captcha protected form, lightbox photo gallery and embedded Google map. This website has a custom built PHP and HTML template and embedded Google map. 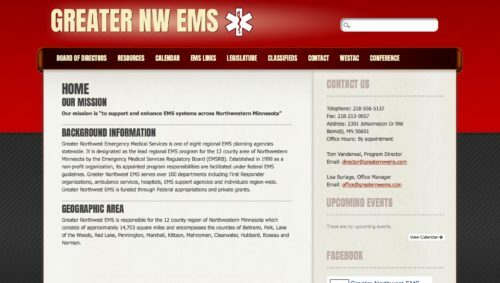 A website designed to encompass the mission of supporting and enhancing EMS systems across Northwestern Minnesota. 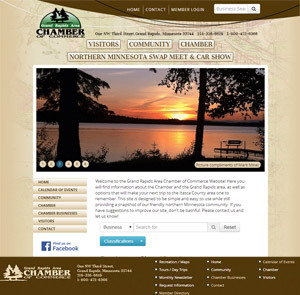 The Chamber’s website features a Content Management System (CMS), fully customized member management system front and back end, and customized calendar system. We customized the design and most of the artwork on the site into a responsive layout. 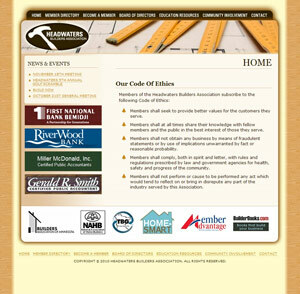 We built Headwaters Builders Association a new logo to start the project and proceeded with a Content Management System (CMS) that included a large member management section along with rotating banner ads. The Lady Slipper Scenic Byway website has a custom built guestbook and Twitter updated feed to go along with the custom built PHP and HTML template. 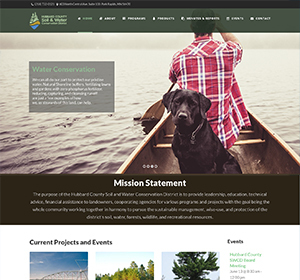 This project combined content from three different websites into one custom built php and html template. The main site is integrated with multiple Google calendars, lightbox photo gallery, an imported weather widget and rotating photos. Also built into this site is a fully customized open source message board, e-mail newsletter system and a customized Street Team management system that utilizes the Google maps API for tracking poster locations for two of Moondance Events’ festivals. We did much of the artwork and some of the photography for this website. 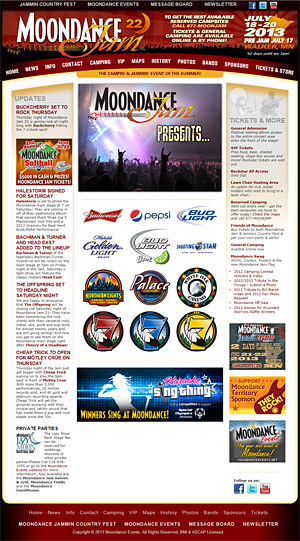 The Moondance Jam site has many custom features to go along with a vast amount of content and shares features with the Moondance Events website. There is a custom built band profile CMS, lightbox photo gallery system, integrated google map, integrated Twitter & RSS news feeds, sponsor rotator and integration with off-site shopping cart. Also, most of the artwork and website content has been customized and written in-house since 1998. 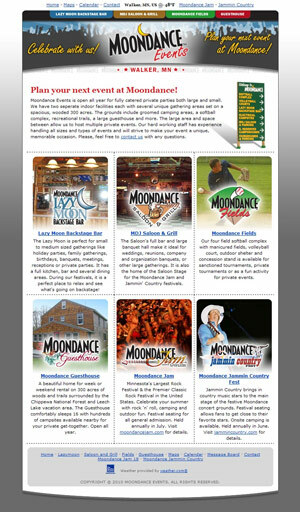 Jammin Country Fest’s website shares many of the features of the Moondance Jam and Moondance Events website. 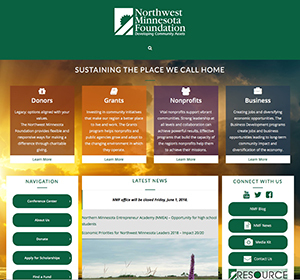 The Northwest Minnesota Foundation invests resources, facilitates collaboration, and promotes philanthropy to make the region a better place to live and work. The website features include the ability to apply for a grant, find a fund/program or donate. The site is also a great resource for entrepreneurs. 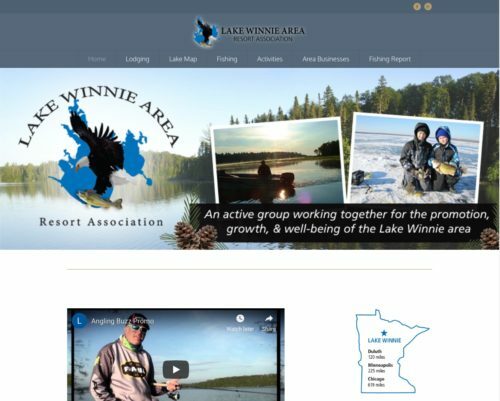 The Lake Winnie Area Resort Association is an active group working together for the promotion, growth, and well-being of the Lake Winnie area. 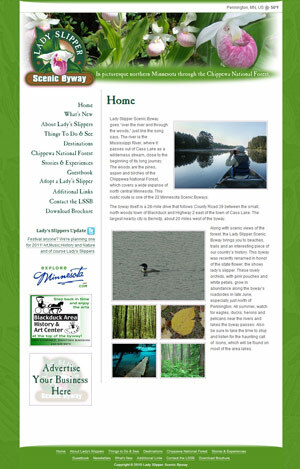 The website showcases lodging, fishing reports, activities and area businesses around Lake Winnie. 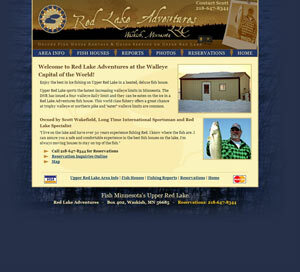 The Red Lake Adventures website features a Content Management System (CMS) to keep up-to-date winter fishing reports. 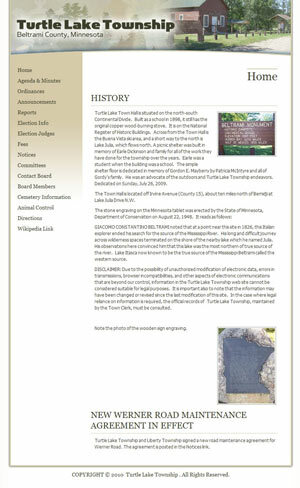 The Turtle Lake Township website was built with a Content Management System (CMS) so the township had a central location to post meeting minutes, announcement and other information for its members.